Minquiz is South Africa’s premier annual national science competition for Grade 12 learners. The provincial round of the competition took place on Thursday, 18 May 2017 at Wynberg Boys High School. Schools are divided into two categories; Platinum and Gold depending on their schools’ average pass rates and how often they have completed in Minquiz in the past. Schools from across the province sent their top three learners to compete both individually as well as in teams. The competition comprises a written quiz completed as individual learners, the marks from this written quiz are used to determine the top 5 schools who go through into an Oral quiz round. The Western Cape competition was quite exciting, with a tie break in the Oral round for the Platinum category between Somerset College and Rondebosch Boys High. In the end Rondebosch scooped the Oral Quiz top prize, while the top individual learner of the written quiz in the Platinum category hailed from Somerset College. Spine Road High gained the Oral Quiz top prize in the Gold Category, the top individual learner was from Monument Park. The Department of Chemical Engineering was the proud host of the Western Cape provincial round of Minquiz 2017. The Western Cape Provincial organizer Dr Kirsten Corin was ably assisted by an eager team of post-grad volunteers to create a very enjoyable event. The National competition took place 18-19 July 2017 at Mintek Head Office in Randburg. 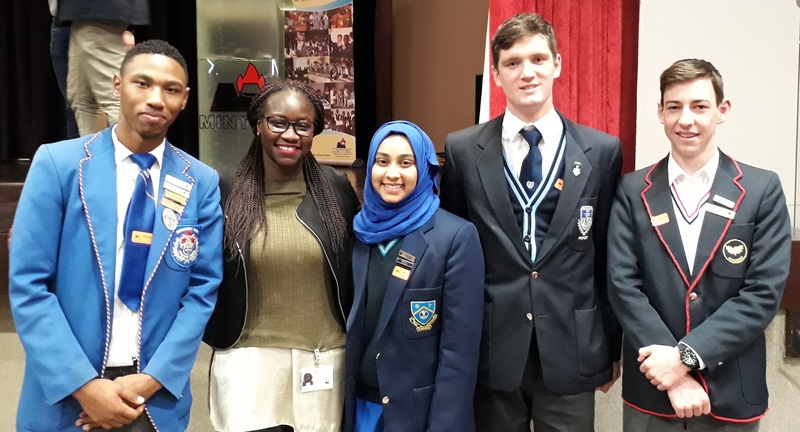 The Western Cape team comprised of learners from SACS, Somerset College, Monument Park and Protea Heights Academy, accompanied by the provincial organizer, Dr Kirsten Corin. Again learners sat for a written quiz which determined the 5 provinces to compete in the Oral quiz round. Ms Nanji Sheni, a recent MSc graduate of UCT and Mintek employee was the MC for the event. Following an intense Oral quiz round, the Western Cape team placed 4th overall. Joshua Putterill from Somerset College took the National Top Leaner award for the Platinum category. Only two distinctions were awarded for the written quiz, both going to Western Cape learners; Joshu Putterill from Somerset College and Adam Begg from SACS. Apart from the grueling quiz, Mintek treated the learners to an interactive workshop after which each learner was challenged to develop a device which would allow an egg to safely drop 3 storeys without breaking. Creativity and a large amount of laughter ensued as each learner dropped their device into Mintek’s central quad. 3 of our Western Cape team’s devices were successful with one gaining the Judge’s Most Ingenius design.